Short Overview: The Extended Trick System Mod is a global mod for THPS3 which provides you with graphical updates, new features and a ton of new tricks like Bigspins, 360 Inward Heelflips and all kinds of Lateflip and Lateshuvit variations! Visit the new skateshop in HD that now includes 140 brand new decks! Other main-features are the option to view the gaps of a level, a cassette menu for the levelmod and the display of the stance (switch / fakie / nollie) next to your tricks! 1. Backup your original files. 4. Move the file to where your Skate3.exe is located and extract it to Tony Hawk 3\Data (should be automatically be selected). 5. If asked to integrate folders click yes. If asked to overwrite files click yes. 6. Wait until the extraction has finished and you're ready to go! - New Design of the ingame Menus. Changed various fonts, colors, scales. - New Design of the ingame Hud. Changed the fonts of the total score, the individual score [THPS2.fnt, converted by Demo] and the trickname; timer also in THPS2.fnt. Replaced the Balance-Arrow. - New medal icons in the mainmenu. - New Cassette menu for the LevelMod levels. - New Ingame menu "View Gaps". Displays all gaps of current level (only available for the original THPS3 levels). - Various new Menus for the Tricksystem. Available in the mainmenu and while playing. - Added the faces of the NS-Team to the CAS menu. - Replaced a few textures in the CAS menu with HQ textures ([Hats]: BB-cap forward / backward, Beanie; [Shirts]: Tanktop). - Replaced almost all logos in the CAS menu with HQ textures. - Replaced all decks of the pro-Skaters with HQ textures (= 140 new decks). - Replaced most of the griptapes with HQ textures. - Replaced all textures of the Skateshop with HQ textures. - Replaced all textures of the Skateshop dealer with HQ textures. - Replaced all textures of your Board (trucks, wheels etc.) with HQ textures. - Fixed a bug of the LevelMod which caused the Tutorial to crash. - Fixed a bug of the LevelMod which caused the Career to be uncompleteable because of crashs in competition levels. - Subway Level: Fixed the material-types of railnodes, added Gaps, replaced trash cans with game objects, added background music. - Added a new park size [80x12]; removed max component limit. - Modified the default cam view (further behind). Modified physics to be more realistic. When hit by a car you don't bail anymore. - Added 4 new trickslots for Liptricks. Rearranged trickmenu in alphabetical order. - Added Switch Ollies. Added Switch, Fakie and Nollie names for Fliptricks. - Added new tricks [custom made animations]: Merlin Twist, 720 Flip, 1080 Flip, Impossible Underflip, Hardflip, 360 Hardflip, 360 Inward Heelflip, Tre Triple Flip, Dolphin Flip, Feather Flip; various Casper tricks (AntiCasper Flip; AntiCasper to Impossible; Casperflip; Casperflip 360 Out; Doubleflip Casper; Impossible Casper; Impossible Casper 360 Out). - Added new tricks [unused animations]: Pogo Air, Double Hardflip, Well Hardflip, Somi Spin, Hospital Flip, Salute, Shove-It Rewind, Spidey Varial, Spidey Flip, 540 Varial, Pogo to Hair Flip. - Renamed 360 Flip to Tre Flip; renamed Kickflip One Foot Tail to Heelflip One Foot Tail; renamed Nollieflip Underflip to Kickflip Underflip; renamed Kickflip Underflip to Kickflip Rewind; renamed Pop Shove-It to BS Shove-It. Moved 540 Flip, Kickflip Rewind, Heelflip One Foot Tail, Quadruple Heelflip from special tricks to hidden combos. Moved Laser flip to normal tricks. - Flip- to Grabtricks can be held as normal Grabtricks now. Added support for Flip to BS Grabs (Kickflip to Melon etc.). - Added Revert support for flatground tricks. Reduced time in Crouch after Reverts. - Adjusted the speed of almost all the airtricks. - Added sound to Primo- / Casper-Slides (bugged). Replaced OutAnimation of Primo with FS Shove-It; of Casper with Tre Flip; of Anti-Casper with Nollie Impossible. - Added hidden Ollie Combos: Ollie Airwalk, Ollie North, Ollie Late Shuv, Ollie Late 360 Shuv, Ollie Lateflip, Ollie Late Doubleflip, Ollie Late Backfoot Varial Heel, Ollie Late Backfoot Heel. - Added hidden Kickflip Combos: Kickflip Late Shuv, Semiflip, Caballerial Flip, Kickflip Rewind, Kickflip Lateflip, Kickflip Late Laserflip, Kickflip Late Heel, FS / BS Flip, Kickflip to Melon, Kickflip to Method, Kickflip to Crossbone. - Added hidden Heelflip Combos: Heelflip Late Shuv, Casper Heelflip, Heelflip Lateflip, Heelflip Late Laserflip, Heelflip Late Heel, FS / BS Heelflip, Heelflip One Foot Tail, Quadruple Heelflip. - Added hidden Gazelle Underflip Combo: Bullflip. - Added hidden Fingerflip Combo: Salflip. - Added hidden Varial Combos: 360 Varial, 540 Varial. - Added hidden Tre Flip Combo: 540 Flip. - Added hidden Varial Kickflip Combos: Tre Double Flip, Sigma Flip, Nightmare Flip, Varial Kickflip Late Shuve, Varial Kickflip Lateflip. - Added hidden Varial Kickflip Combos: Epsilon Flip, Daydream Flip, Varial Heelflip Late Shuve, Varial Heelflip Lateflip. - Added hidden Hardflip Combos: Hardflip Lateflip, Hardflip Late Shuv, Ghetto Bird. - Added hidden Impossible Combos: Impossible Lateflip, Impossible Late Shuv. - Added hidden Combos for various Grabtricks: Fingerflip Out, Salflip Out, Judo to Madonna. - Added various Freestlye Tricks as hidden Ground combos: Primo Slide, Casper Slide, Handstand, Sproing, Truckstand, One Wheel Nosemanual, Rail to Manual, Rail to Nosemanual, Pogo to Hair Flip. - Added Noseblunt and Blunt as hidden Liptricks. This my first mod, looking forward to your feedback and suggestions Planning on adding Nollie animations to the new tricks and a few more custom animations, especially freestyle tricks, in future versions. You really can do a lot with the scripts. Last edited by rodneyM7 on Mon May 28, 2018 8:33 pm, edited 1 time in total. Just move the file to Data/Scripts and replace the old groundtricks.qb. An impressive mod you made indeed! Thanks so much! But I wonder if it's only for me but also for other people when choosing some levels the game crash. For example, THPS4 level San Fransico. Maybe it's because I haven't installed HD texture mod. - fixed some things in the gap check lists. The listed Names are identical to the displayed gap names. - fixed an issue with manual that caused the game to crash (see patch above). - Freestyle Handplants: All of the 8 liptricks which involve a handplant (Invert, Gymnast Plant etc.) are available as flatground tricks (see image above). 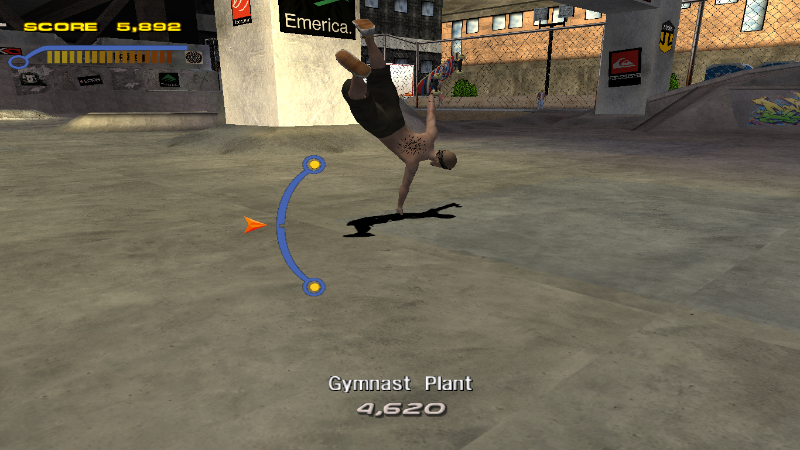 The camera angle for all liptricks in general has been adjusted (the full skater is visible now). - Restructured the flatground trick system and moved a few tricks from special tricks to normal manuals. You now basically have 12 default flatground tricks: Primo Slide, Casper Slide, Truckstand, Handstand, One Wheel Manual, Sproing, AntiCasper, Mullen's Railflip (the trick Rodney Mullen does at the start of a run) and a couple of taunts. Most of the old hidden tricks have been replaced, that means: Originally the game just blends one animation into another which usually looks pretty unrealistic. Many of these transitions, like from a Casper to a Primo, have been replaced with custom made animations. - added a slide sound for (Anti)Casper and Primo Slides. - increased friction of (Anti)Casper, Primo Slides and Truckstand. - adjusted the scores of the default and extra Manuals (not the Special ones). - Casper 360 Flip; Casper to Truckstand; Casper to Anticasper; Casper to Primo. - Casper Spin (this one is a bit weird. I recommend using this only on flatground and only when you still have some speed). - Railflip [old]; Rail Laserflip to Rail; Railflip to Casper; Rail to Handstand; Railflip to AntiCasper; Rail to (Nose)Manual. - Shove-It to (Nose)Manual; 360 Shove-It to (Nose)Manual. These are nothing special really but still nice to have. Installation: Just replace the Scripts folder (Tony Hawk 3/Data/Scripts). First of all, I'm not sure why there's not more feedback in this thread, because you did a fantastic job with this mod, really! I found out there's a modding scene for the Tony Hawk's series just two days ago while getting THPS3 (my favourite in the series) to work. Couldn't believe someone is putting in this much work into the game in 2017/18. That's awesome! Hats off to you. I just played my first session with the mod and it's really cool. I started a new career run before installing the mod and completed all the goals in Foundry in like ten minutes (even after 15+ years lmao). Then I installed the mod and the increase in difficulty with the physics overhaul really took me by surprise. Impressing those Canadian skaters is actually tough now, especially the one on the curved quarter pipe (I started with Rodney Mullen. Barely enough airtime for a 360). Getting to the secret tape in Canada also got a lot harder. The higher difficulty for some of the level goals actually creates a fresh dynamic for Career Mode. If you want all goals, I feel like there is stuff in earlier levels you have to come back to way later once you've really beefed up your stats. I like that a lot. Sort of gives things like Secret Tapes more meaning. In a way, this moves the focus of those goals away from the puzzle aspect and more towards skill, although I'm not sure how much of that is actual personal skill (casual player here) versus skater stats. I'm excited to spend more time with it and find out! I will play more and maybe come back with more feedback if I have something constructive. Thanks for your feedback fr0y0! A fresh dynamic for the career mode is exactly what I was aiming for (aside from making the physics more realistic)! Glad you enjoyed it, let me know if there's anything that could be improved or needs further work. Although I don't have very much time currently I'm still constantly working on the mod. Hopefully version 2.0 will be ready for release before the end of the year. There won't be that much new content because many animations and other things need to be reworked but a cool new feature is going to be an improved slowmo mode. So - unlike the slowmo cheat in the original game - you will actually be able to do all fliptricks in real slow motion now.